As you can imagine, one of the questions I’m most frequently asked is: “What’s your favourite restaurant?”. My usual response: “That’s an impossible question to answer…it depends on your mood, the weather, what you ate the day before…a whole menu of reasons that prevent me from sticking my neck out and naming one particular eatery. Having said that, my reasons are totally justified and it does depend…on a whole bunch of things. But today I’m going to get off my restaurant fence and say it: La Mouette is my favourite restaurant in Cape Town! Situated just around the corner from where we’re staying in Sea Point, this fabulous local eatery opened in 2010 and we visit several times every year. It has a lovely courtyard, friendly welcoming service and a chef called Henry Vigar who is totally genius. This year it was named in the top-20 restaurants in South Africa in the Eat Out awards which is quite some achievement – it’s a country abounding in fabulous places to eat. I always get a feeling of excitement and anticipation leading up to a La Mouette visit. Today we went for lunch for the first time (it’s only open for Sunday lunch) and it was beautiful to sit under huge umbrellas on a perfect, sunny Sea Point day. The menu was full of intriguing choices…and once we’d ordered (which took serious concentration and consideration) we were presented with a beautiful plate from the chef. 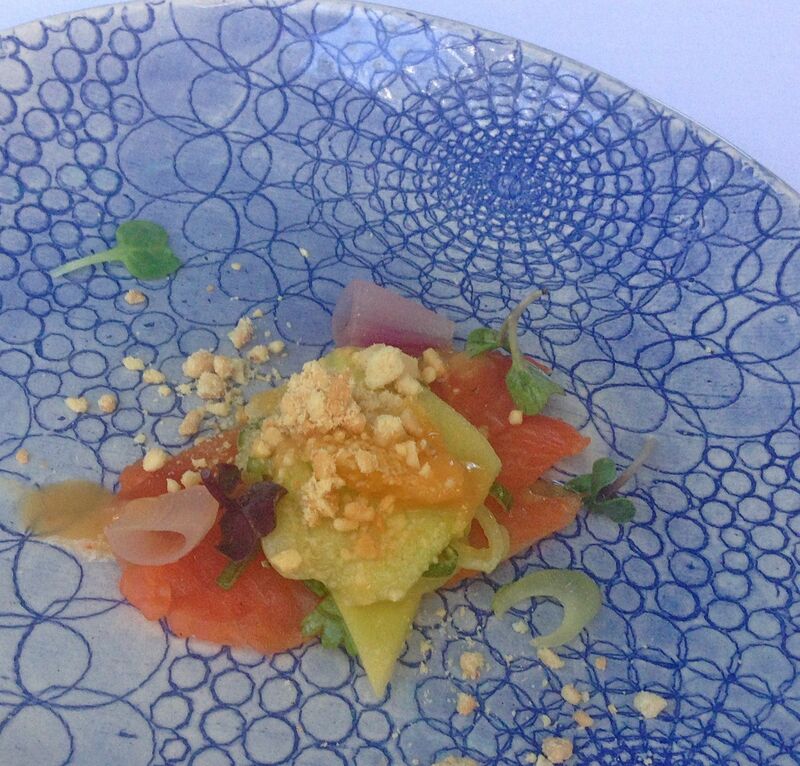 This salmon gravalax with mango and fennel was wonderfully light and refreshing, the perfect start to a summer lunch. We all really loved the plates and wanted to take them home! I’d been desperate to taste this take on vichyssoise since seeing it posted on facebook. 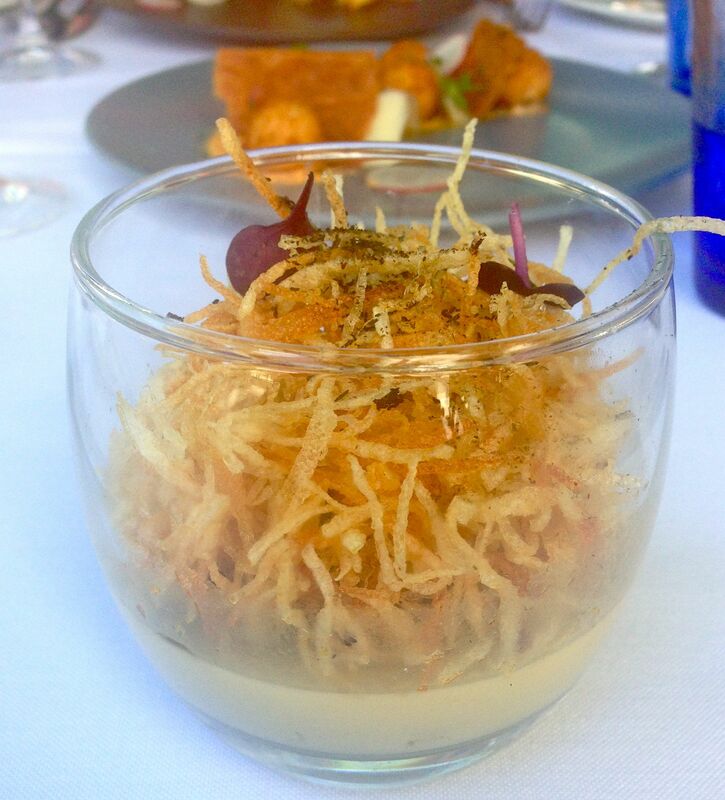 Such a clever idea – smoked leeks, leek ash, crispy potatoes and a leek and potato panna cotta. Served in a plump glass, the softly creamy panna cotta was perfectly complemented by the delightfully crispy strips of potato. When I go out with a group of people I always seem to award a prize (in my head) for the best order of the day – not that I’m saying eating out is any sort of competition! It’s more a way of me mentally filing the dishes to order on my return. 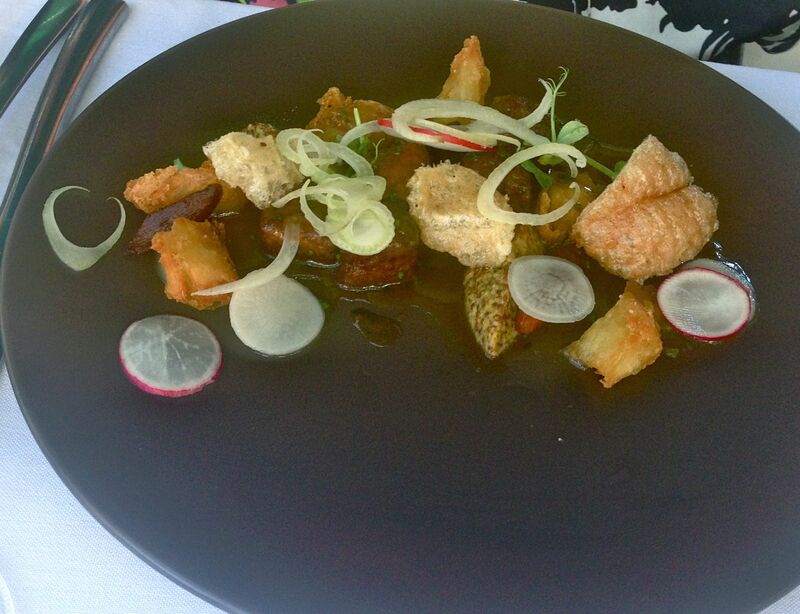 So here it is, the winning starter – the amazing roast pork dinner starter with triple cooked potatoes, mustard, pickled turnips, apple and fennel. The tenderest of pork packed with flavour with beautiful morsels of crackling. My mouth is watering just writing about it. And then there’s the tuna. 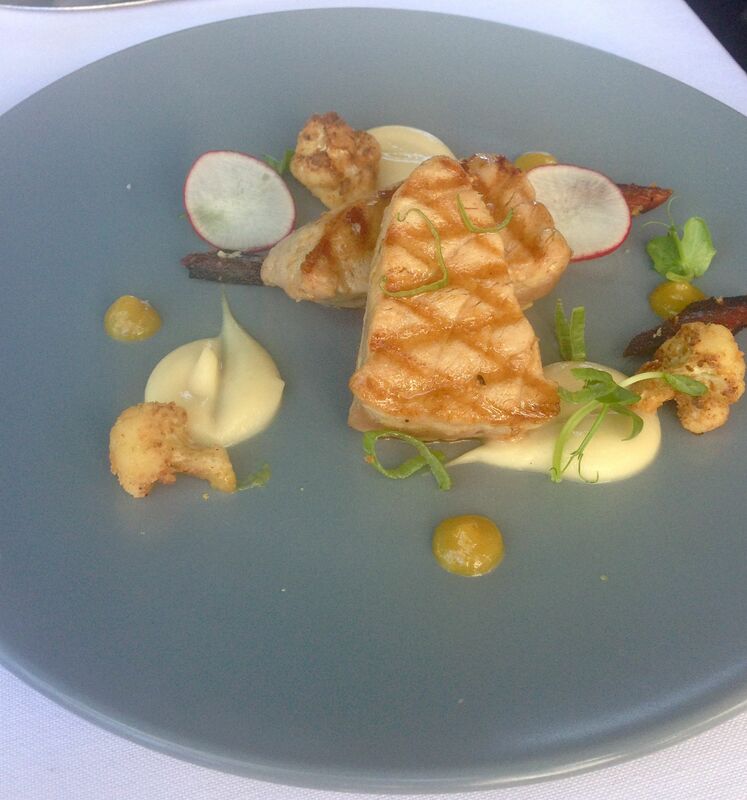 Grilled with a tamarind glaze, raisin puree, crispy cauliflower and a carrot and cauliflower emulsion. A fabulous combo of textures and flavours with wonderfully rare fresh tuna. 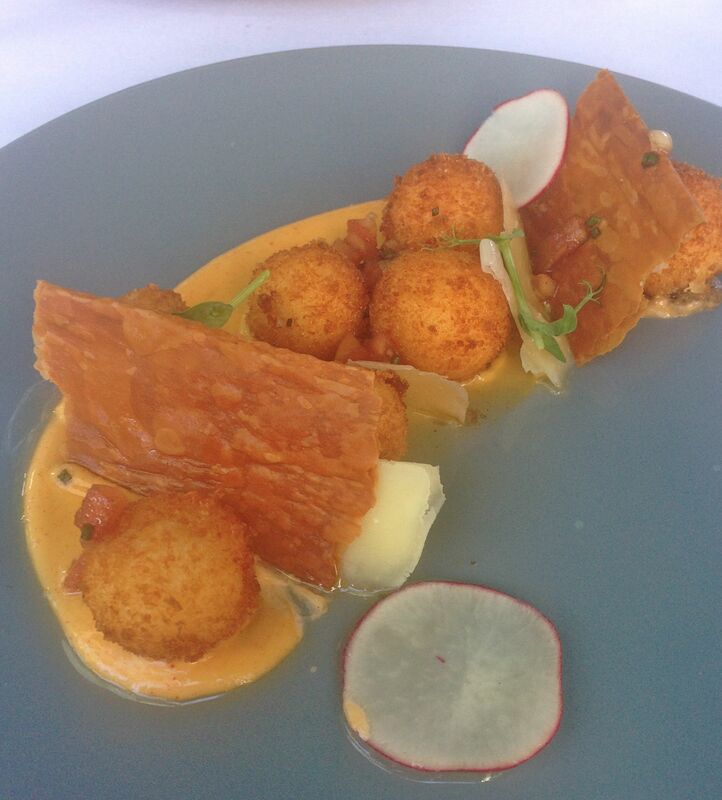 La Mouette’s truffle and cheese croquettes are legendary. Impossible to resist, so when no one ordered these little balls of delight I had to push the boat out and order a portion for the table. The dish has been adapted recently and now comes with mushroom pesto, grilled asparagus, truffle dressing and shaved parmesan. Wow! The most amazing of dishes is now even better. 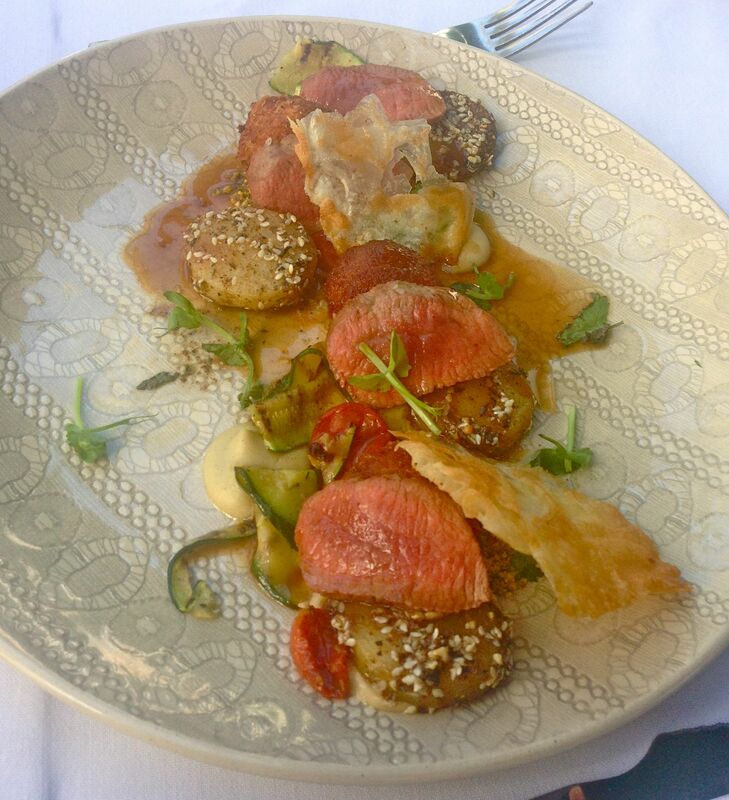 If you go to La Mouette you have to order them, treat yourself to an extra dish…you won’t regret it. This cornucopia of lamb from Namibia was stupendous. 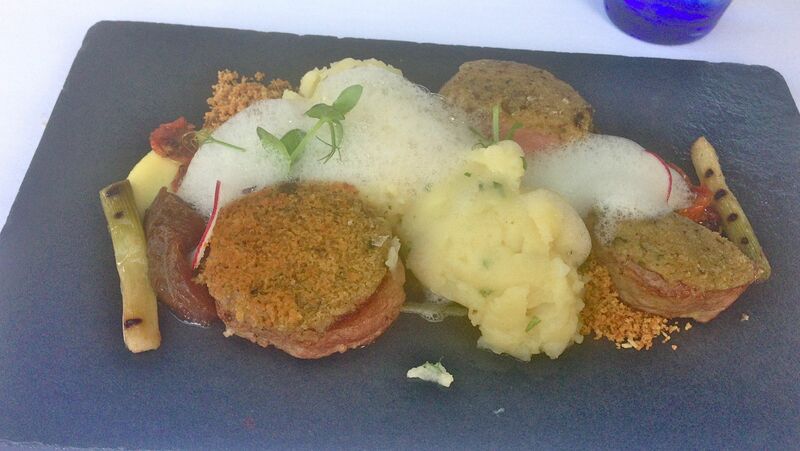 Loin, croquette and sweetbreads were served with chickpea puree, pistacchio crumble, shanklish, apricot and saffron. 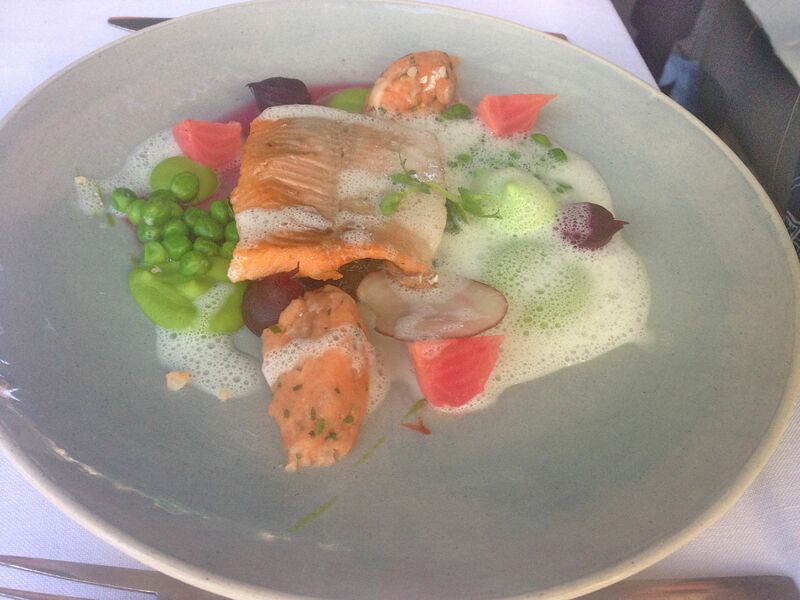 The Franschhoek trout was a picture of pink and green and served with pea mousseline, beetroot, horseradish foam, smoked potatoes and goats cheese croquettes. Today I think I won the (virtual) prize for best main course. The beef ribeye came with the sweetest of onion chutney, amazing crushed, herby potatoes, parmesan crumble, truffle emulsion, a black pepper crust and tomato foam. The beautifully tender beef, pepper crust and the wonderfully truffly sauce was a match made in heaven. One that I devoured with gusto. Despite a range of tempting dishes on the menu I would totally order this again on my next visit! What can I say? La Mouette’s food seems to get better and better, the presentation is amazing as you can see from these show-stopping pictures and (which does put it in a fine dining league of its own), it is fabulously good value. 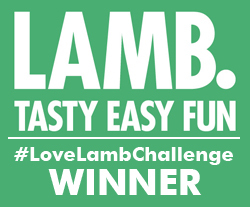 The six-course tasting menu is £295 (about £17), starters are R65-R70 (about £4) and mains R155-R185 (about £9-£11). I can’t imagine you’ll get better value anywhere – so much so one of our table thought the prices on the menu had to be a mistake. There’s no mistaking this is one fine restaurant…and now it’s officially my favourite in the Mother City…for now anyway (sorry I just can’t get completely off that fence). What is your favourite restaurant in Cape Town? Or anywhere else in the world? I’d love to hear all about it from you. La Mouette is at 78 Regent Street, Sea Point, Cape Town.